What’s your word for the year? I’m sure in January you probably saw social media posts about this question. You may have even selected a word and are living it right now as you read this. I have to admit, when I first found out this was “a thing” to do, I was intrigued. What word would I choose? Would I even be focused enough to follow through with it? Could having a word guide me through my year? What if I changed my mind half way through the year and decided to choose another word? Clearly I wasn’t sure how all this should work! But this past December, I landed upon the “perfect” word. Here’s what happened. There was a time though that I kept meticulous photo albums. As soon as I would get my photos back from the photo lab, I would sort through them and write the date taken, where they were taken and who was in them before putting them – IN ORDER – into my albums. When my kids started coming along, it got harder to sort through photos and get rid of any. 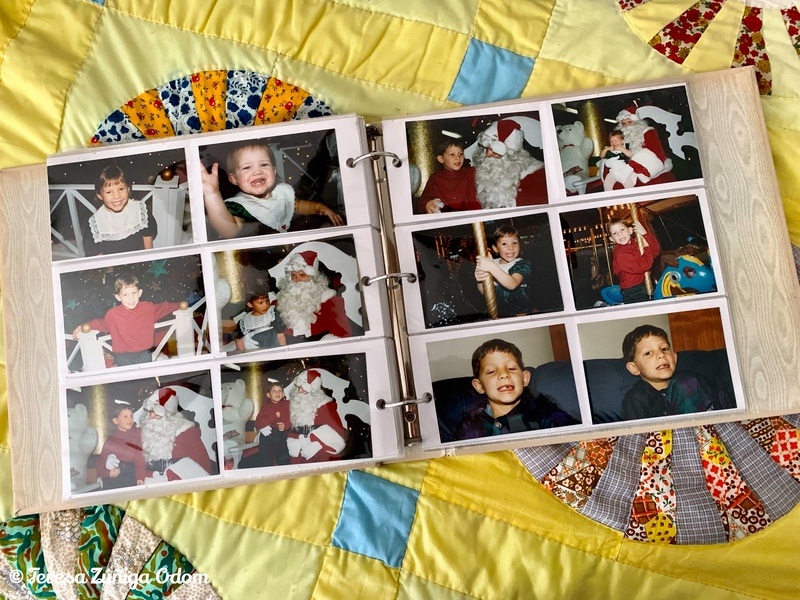 I mean…these were pictures of my kids! How could I throw even one away, even if it was a little blurry or I didn’t like the way I looked in that photo…my child looked SO ADORABLE! So what I started to do was to select the best picture of the several I would take of a grouping and put the best one on top and tuck the other 2 or 3 behind it and then place them in the albums. So in December, as I was going through my albums I came across a photo of me with my three kids at Brookwood Mall. Emily was just a baby, Charlie was 5 and Anna Marie just 3 years old. We were trying to get a group shot in front of one of the little Christmas trees that were placed around the mall. Well… it was a struggle to say the least. We couldn’t get all the kids to look forward at the same time and eventually we had three out of four of us so that was the photo that was displayed in the album. Then I pulled the photo out of its slot and two others tumbled. These were the ones that weren’t deemed “perfect” to display. But you know what? The photo I decided to use wasn’t the perfect photo. The photo where I was trying to get Emily to turn around in my arms and my head was turned away and Charlie looked completely bored and Anna Marie was on the ground grinning ear to ear oblivious to what was happening around her…yeah, that was the perfect photo. Actually, it was “perfectly-imperfect.” I even made that comment when I posted it on Instagram. I thought about this the next few weeks. A lot. How many times do we see social media posts that are perfectly staged and the lighting is beautiful and everyone is shiny and new, so to speak? I know I’m guilty of it…we all are to some degree. But these older photos were really speaking to me about the beauty of imperfection. Think about it. Today we can instantaneously see a photo taken through digital photography or our IPhones. We can retake and retake until we get it just right. But back when I was using film, you had to patiently wait for the film to be developed and then drive to the store to pick up the photos. You really didn’t know what you were going to get until you flipped through the envelope. There was a bit of excitement too when I would do that, hoping that I got just the right photo of an event. Sometimes I did, and sometimes I didn’t. On Christmas Eve this past year, I had all my kids home and it all came full circle. After they all put on their Christmas PJs, we began trying to get a group photo in front of our tree and with their dogs! The struggle was real but oh what a fun struggle it was! I just kept clicking my camera as my kids kept trying to get their dogs to face me for that perfect shot. Well, we got that perfect photo, but you know what? My favorite photo was the one I captured right before that perfect photo. It shows Emily hugging our family dog, Lucy, and Anna Marie and Ryan rubbing their dog Lucia’s head while trying to get him to sit still, and Charlie getting a grip on his dog, Scarlett. It was just like the photo I would have hidden behind the perfect photo in my old photo album days. But now I realize…this was the perfect best photo. So, my word for 2019? It’s actually two words…perfectly imperfect. But as a friend said this morning when I was telling her this story, you can always hyphenate and make it one word! That was “perfect” advice. 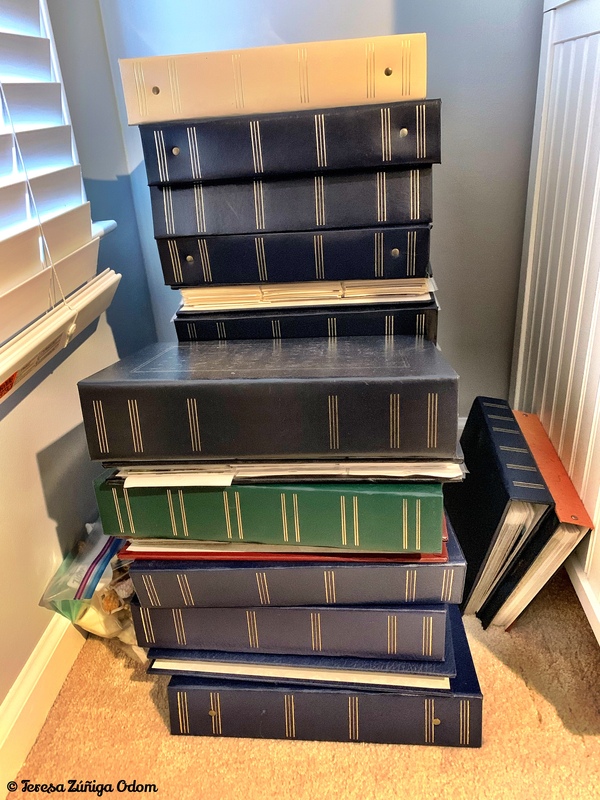 This entry was posted in Odom Family, Photography and tagged Marie Kondo, Perfectly Imperfect, Word of the Year on March 12, 2019 by Southern Señora. We got home last night from spending Thanksgiving at the beach with extended family. Last year Eddie and I spent a long weekend in Orange Beach in October with my brother-in-law Terry and niece, TJ. When we left, we talked about the upcoming Thanksgiving holiday and thought we might try to plan a week at the beach. It was too close to Thanksgiving last year to pull it off so we decided this year would be the year to do it! After our traditional family gathering the weekend before in Athens, AL at my niece/nephew Kate and David’s home, we packed up and headed to Orange Beach on Tuesday. My mother went with us as well as our daughter Emily. My son Charlie and his girlfriend, Danielle joined us Thanksgiving night. We were also joined by Kate and David, my brother-in-law Allen and his wife, Rhonda and their son, Jason. There were 12 of us Odoms total. My brother-in-law, Terry keeps his boat on Ono Island so he is very familiar with restaurants and places to go so he kept up entertained the whole time we were there. 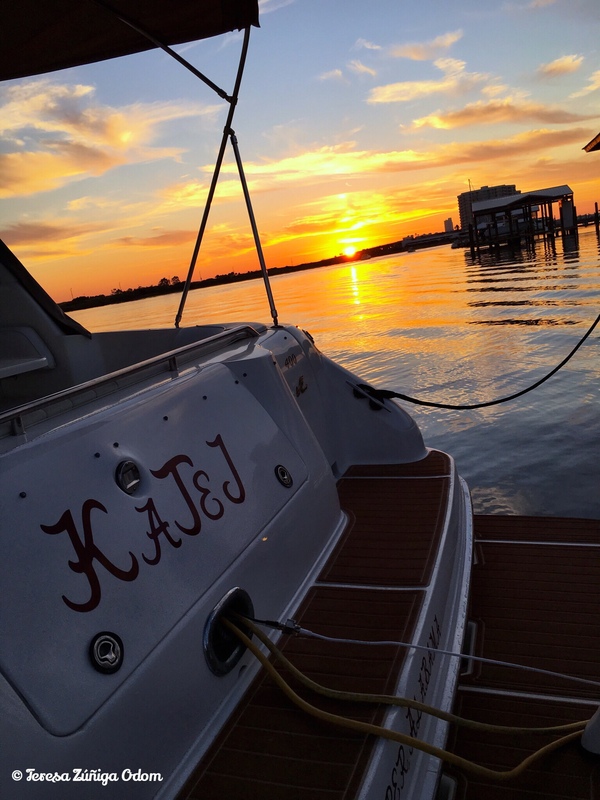 Riding on the boat, dining at places like the Flora-Bama Yacht club and Tacky Jacks and just hanging out on the dock to fish, kayak, paddle board and watch the sunset…it was the perfect setting for everyone to spend time together and just relax. Traditional Thanksgiving dinner at Live Bait! For Thanksgiving day, we had lunch at Live Bait. I knew it was a buffet but didn’t realize it was a traditional Thanksgiving dinner buffet! It was nice to have turkey and dressing and gravy at the beach and not have to cook and clean up for a change. Of course, today I was thinking it would have been nice to have had some leftovers!!! Ha! Helping Jason get his car going! Our final act was to hang around on Saturday as we were leaving to help my nephew Jason get his car repaired. My son, Charlie came to the rescue along with my BIL-Terry with his connections in town. Family sticks together! We even had a little caravan out of Orange Beach until we all hit I-65! It was a great week at the beach…making memories and celebrating our family. Here are a few I captured this week. 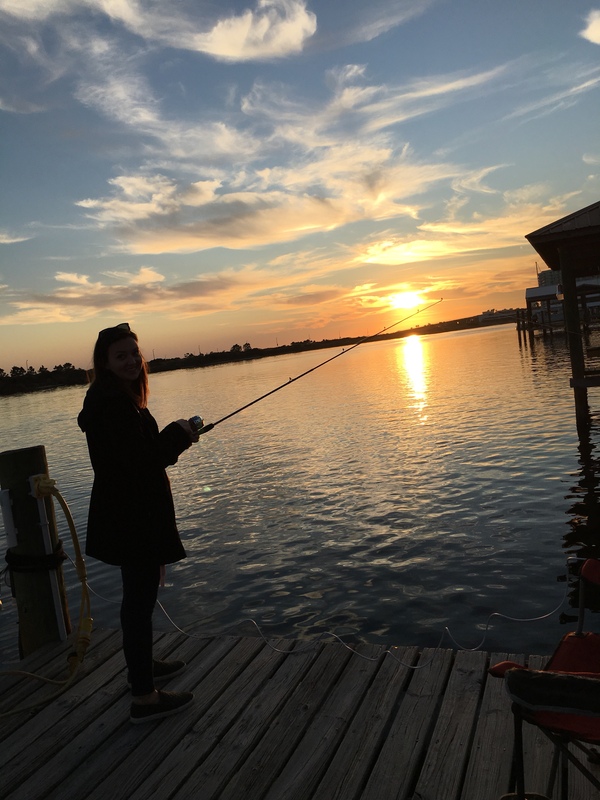 This entry was posted in Blog Like Crazy, Odom Family, Thanksgiving and tagged Beach trip, Blog Like Crazy, Flora-Bama, Live Bait, Odom Family, Orange Beach, Tacky Jacks, Thanksgiving on November 26, 2017 by Southern Señora. 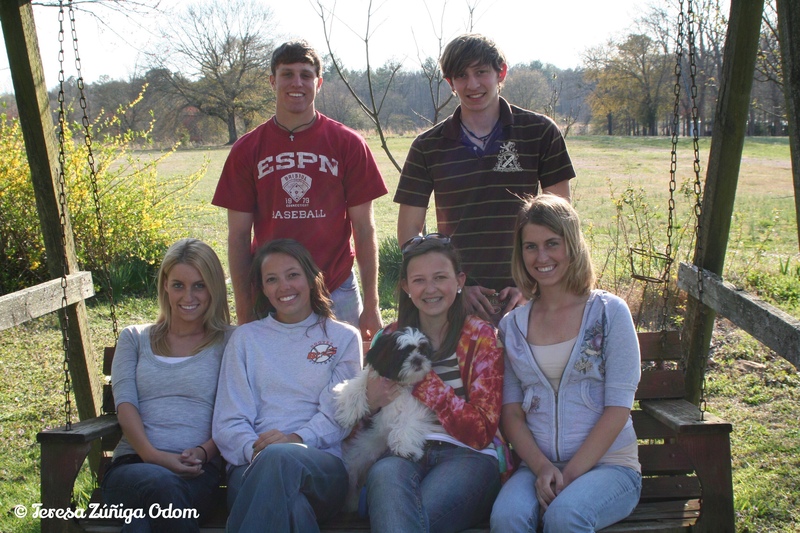 Odom Thanksgiving at Kate and David’s House! 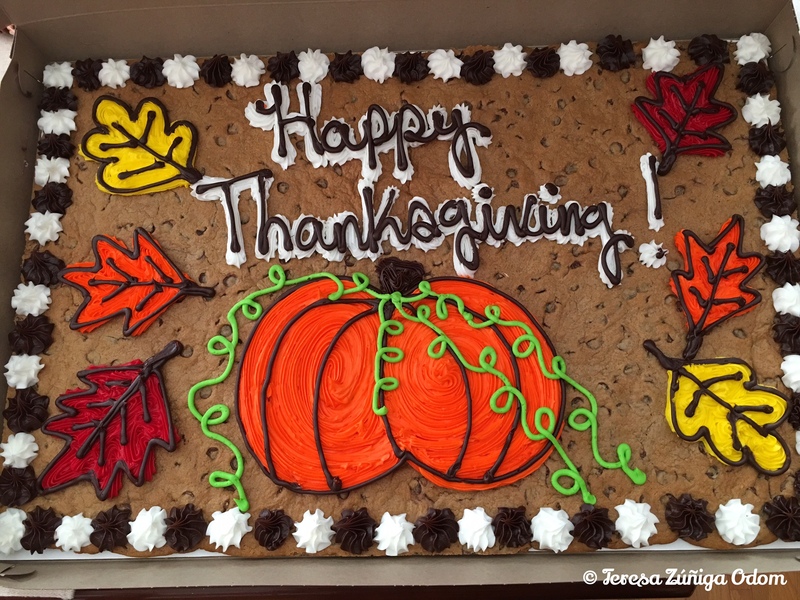 The Big Thanksgiving Cookie – it’s a family tradition! 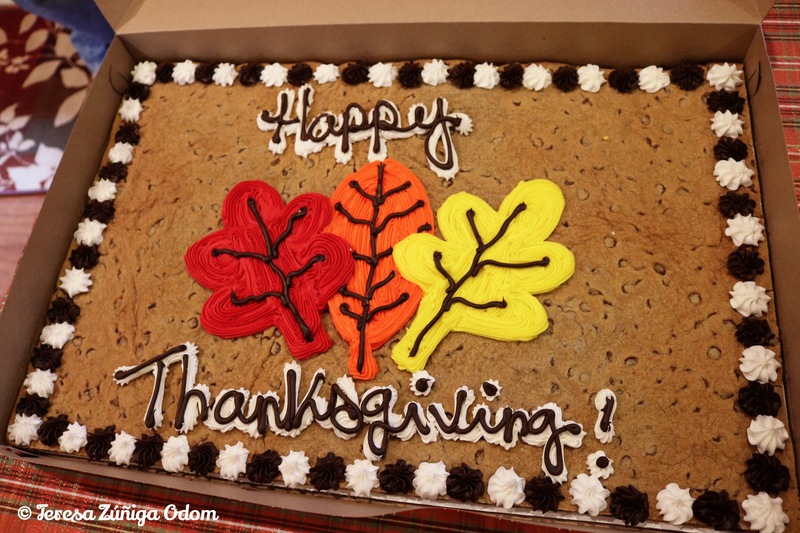 The Big Thanksgiving Cookie – it’s a family tradition!Thanksgiving doesn’t officially happen until November 23rd, but this year the Odom family had the gathering a little earlier than usual. As all of our kids get older and everyone moves out of the general Birmingham/Jasper area, we are getting creative with how we celebrate and where! 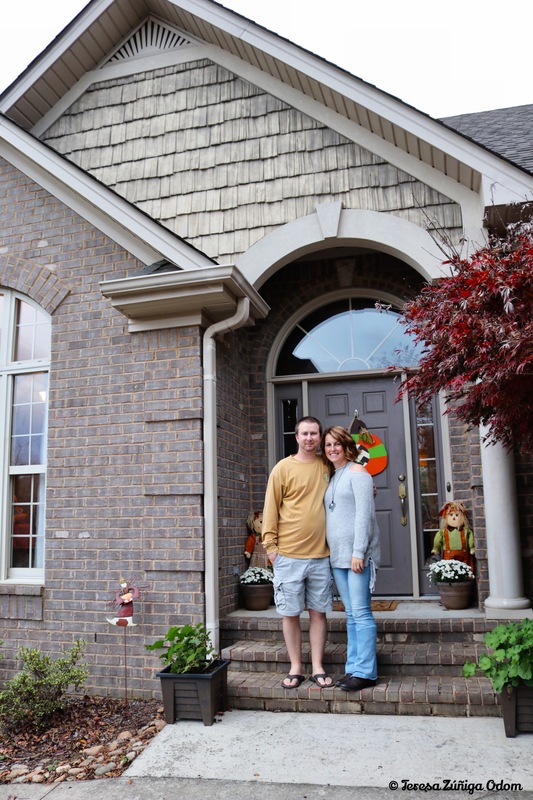 Kate and David outside their new home in Athens, AL! 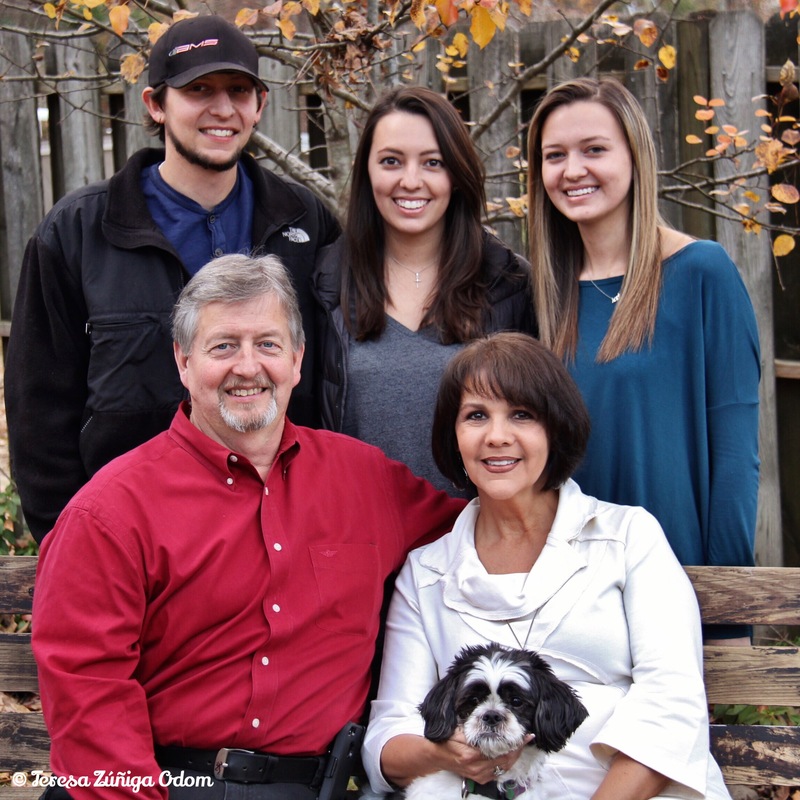 This year, my niece Kate and her husband David wanted to host the family at their new home in Athens, Alabama. Kate and I kept in touch the week of the gathering via text message down to Kate making sure we had pumpkin pie covered for my daughter Emily. (I thought it was so sweet that Kate remembered how much her cousin loves pumpkin pie!) Their home is beautiful and there was plenty of space for everyone to spread out and enjoy each other’s company. But you know where everyone gathered, right? Yep…the kitchen! I told Kate that they have the same situation we have at our house…the end of the island is right in front of the refrigerator and that’s where everyone wants to stand! Of course, I said this as I was standing there opening a bottle of wine!! Mom enjoying the company of Charlie, Danielle, Allen and Rhonda. TJ and Carla enjoying Thanksgiving mimosas! David’s mom, Connie, watches him carve the turkey. David with his dad, David. Everyone was able to be there this year except for my daughter Anna Marie and her hubby Ryan. They were in town last weekend from Colorado for a family wedding so couldn’t return again this weekend. We were also missing my nephew Dustin and his daughter Maddie. They always make the gathering more lively! We missed them all. But we are working on a cousin reunion in December when everyone is back in town so stay tuned! 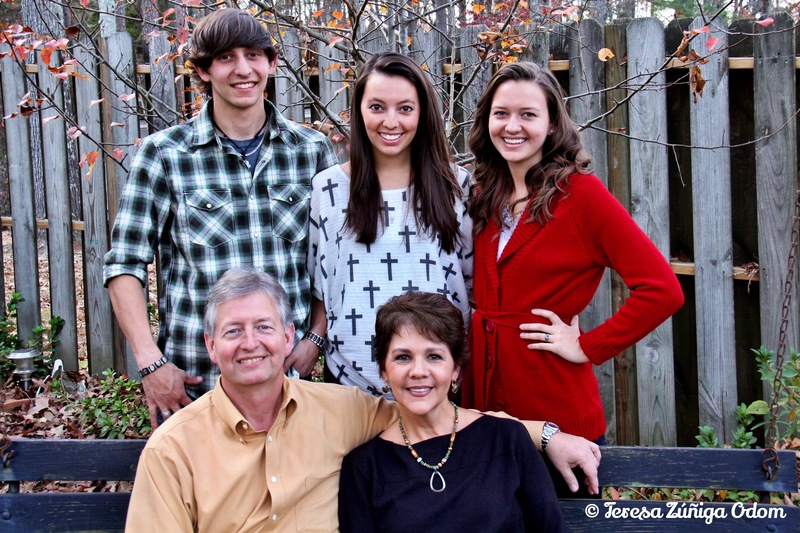 “Swing” photo – minus the swing – of the grandkids! Zuniga-Odom Family photo – space left to insert Anna and Ryan! Our gathering was just what this family needed…great food, great wine (thank you Perry’s Steakhouse! 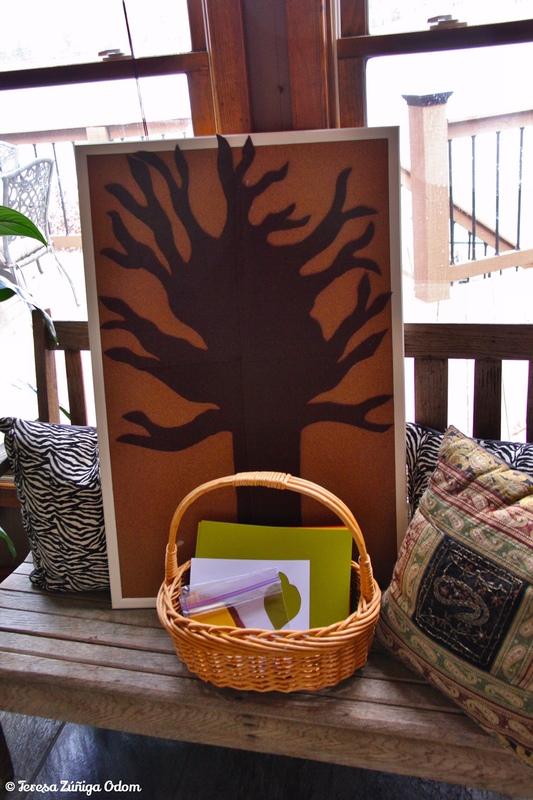 ), the tradition of our Thankful Tree, group photos and of course, the big cookie! I didn’t take as many photos as I normally do…surprise…but here are several I took throughout the day. Happy “early” Thanksgiving, everyone! Outtakes from the group photos! We have no selfie control! This entry was posted in Blog Like Crazy, Odom Family, Photography, Thanksgiving and tagged Canon Photography, Huntsville, iphone photography, Odom Family, Photography, Thanksgiving, The Big Cookie on November 19, 2017 by Southern Señora. The annual Odom Family Thanksgiving Cookie! Always a hit! Today the Odom family gathered at our house to celebrate our annual Thanksgiving dinner. I could go into detail about the preparations, the decorations, the food, and the conversations but I won’t. I could also make a list of all the things I’m thankful for this year but I think the best way to show this would be to just share the photos I took today. I’ll also share the messages several of us wrote for our Thankful Tree, a tradition be started a few years ago and that I hope will continue for many years to come. This entry was posted in Blog Like Crazy, Bloglikecrazy, Odom Family, Thanksgiving, Zuniga Family and tagged Bloglikecrazy, Odom Family, Photography, Thankful, Thankful tree, Zuniga Family on November 19, 2016 by Southern Señora.